When North Korea launched a series of increasingly potent missiles last year, analysts were left scratching their heads. How had the renegade regime's weapons program advanced so quickly? The answer may lie more than 4,000 miles away, in eastern Ukraine, according to one nuclear expert. Michael Elleman is convinced that North Korea's recent missiles were powered by engines made at a once-buzzing factory in the former Soviet Union. 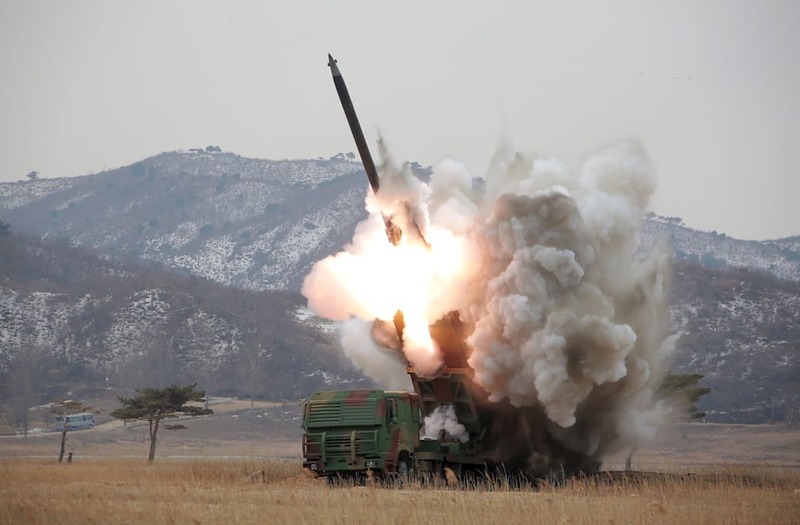 Elleman, a senior fellow for missile defense at the International Institute for Strategic Studies, a think tank, believes that Pyongyang acquired the 1960s Soviet-era missile engine known as the RD-250 within the past two years. With some slight adjustments, Kim Jong Un's government used that engine to successfully launch a medium-range missile and twointercontinental ballistic missiles, he says. In a report published late last year, Elleman suggested that North Korea had procured the high-powered Soviet engines through a network of arms smugglers. He said it was unlikely that the transfer had been sanctioned by the Russian government or even those operating the warehouses and factories. "These facilities have what we call 'bone yards' where you have old engines that are no longer in service that are just stored," he said. "It's not surprising that there are dozens that would be available for transfer." At about 6.5 feet tall and 3 feet wide, and weighing 800 or 900 pounds, the engines could be boxed and transported like a big motorcycle, Elleman suggested. More on MSNBC's 'On Assignment with Richard Engel' Friday at 9 p.m.
To design the engine itself or build it from blueprints, North Korea would have had to conduct dozens, if not hundreds, of tests. Elleman notes that the Soviets tested the engine 300 to 400 times. It seems that North Korea conducted only two ground tests — in September 2016 and last March — before its successful missile launches. "The absence of that testing in North Korea is highly suggestive of importing the entire engine from the former Soviet Union," Elleman said. "It wouldn't be surprising if a few rogue scientists were in North Korea working to support their programs." Elleman believes that a raft of failures using an earlier engine type prompted Pyongyang to hunt for the RD-250. One of the North's engines, the Musudan, a medium-range missile that is powered by different engine, exploded at takeoff or shortly thereafter in seven out of eight tests in 2016, he said. "They suddenly shifted gears, and this new engine appeared," Elleman said. Elleman considers it highly improbable that the North Koreans reverse-engineered their engine from a single RD-250 because it is unlikely they would have had access to the same manufacturing equipment used by the Soviets in the 1960s. The engine was designed by Russian engineer Valentin Glushko and built at the Yuzhnoye factory near Dnipro, Ukraine. It powered one of the Soviet Union's ICBMs, known as the SS-9. The engines were sitting idle in eastern Ukraine until acquired by the North Koreans, Elleman suggests. "These were old, vintage stocks that were sitting in warehouses," he said. Underfunded and possibly short-staffed, the Yuzhnoye factory would have been an easy target for arms dealers — especially amid the chaos of conflict in the nearby Donbass region of Ukraine. Since 2014, Ukrainian soldiers and Russian-backed separatists have been fighting for territorial control there. However, Yuzhnoye has issued a point-by-point rebuttal to Elleman's claims. Elleman still says that the engines deployed by North Korea were modified from the original RD-250 into a single-chamber device — sophisticated adjustments that were likely overseen by engineers from the former Soviet Union. "It wouldn't be surprising if a few rogue scientists were in North Korea working to support their programs," he said. North Korea has long relied on Soviet missile hardware, technology and engineering talent in its nuclear program. The Musudan missile was itself a derivative of a Soviet submarine-launched missile, acquired in the late 1980s or early '90s. In the 1990s, a number of Soviet engineers were apprehended at a Moscow airport en route to North Korea, but it is likely that others got through to Pyongyang. If North Korea did in fact acquire the engines recently, it raises questions about what U.S. intelligence agencies knew, and when. "My guess is if they did know about it, it was post-fact, after the transfer occurred," Elleman offered. The technical capabilities of the North Koreans should not be discounted, Elleman noted, since they fabricate the airframes and the propellant tanks. Elleman says he still believes it is still possible to halt the nuclear program before Pyongyang can definitively claim the ability to strike the U.S. with a nuclear warhead. Negotiations, he believes, could lead to a moratorium on flight and nuclear tests, or the production of fissile material. But that window is closing rapidly. "After the Olympics are concluded, I fully anticipate that they'll resume testing," Elleman said. "And with each test they become closer and closer to having a reliable capacity to target and hit the U.S. with a nuclear weapon."